Where can I buy those DIY Japanese candys? The Japanese candys you see online are called Popin’ Cookin’ and are gummy candy made in Japan. It is handmade candy that makes sweets of menu that is exactly like the real food. The ingredients are Sugar, dextrose, vegetable oils and fats, starch, dextrin, lactose, syrup, coloring. Sadly, instructions come in Japanese, yet they are numbered packages and it is somehow easy to follow, but your kids will need supervision. 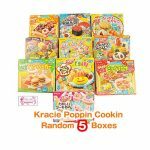 This entry was posted in Anything else and tagged candy, candy japan, diy japan, diy japanese, japanese food, pooping cooking, popin cookin on April 5, 2017 by WhereCanWeBuy.